They are the most unusual contract employees working on city property, and their work agreement shows it. The employees were guaranteed to have “no history of kicking, biting, or head butting,” for one thing. While they would come with their own hay to eat, their employers would make sure to water them. And the workers were expected to be surrounded by electric fences while they did their work, with only the occasional bleat. The city of Boston released documents related to the “goatscaping” project in the West Street urban wild in Hyde Park after a public records request from the MuckRock website, which specializes in Freedom of Information requests. 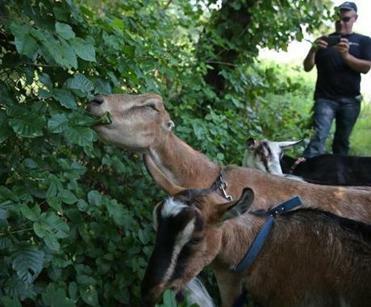 The goatscaping project — in which four goats have been deployed to munch their way through 2 acres of invasive plants and poison ivy that had overtaken the wooded area — was undertaken by the Southwest Boston Community Development Corp. on land owned by the city, officials said. The city has enlisted the four-legged helpers to clear an area overrun with invasive plants. Last month, officials from the group said grants covered the $2,800 cost of renting the goats. The documents released by the city included the contract between the development group and the Goatscaping Co. of Plymouth. On July 7, 2014, community outreach members went door to door to pass out fliers announcing the goat landscaping project and to recruit children volunteers to help feed the four-legged mowers. Below is a collection of some of the responses. no, but will think about it if noone can. Joked about eating "we are all looking out for eachother"
son int. in feed/water, mom will clear out yard, let us know if any noise invited me in, offered food and water, 4 dogs, excited! will call if noise wasn't feeling well, but excited about goats! interested in providing water "whole neighborhood looks out for eachother"
Martin Finucane is at martin.finucane@globe.com. Globe correspondent Trisha Thadani contributed to this story.